Looking forward for the long weekend? Get ready as you have the chance to own exciting and cool gadgets at an affordable price! 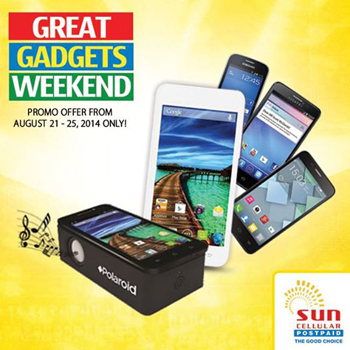 Just visit the nearest Sun shop in your area and join Sun Postpaid’s Great Gadgets Sale 2014 from August 21-25, 2014. Enjoy as much as 60% Off discounts on great and trendy Samsung and Alcatel Android Phones, and wearable Polaroid devices as well as discounted Sun Postpaid Plans! Get these with plans of as low as Php 350 only! What are you waiting for? Hurry up now and own the gadget of your choice on Sun Postpaid’s Great Gadgets Sale 2014! If you want the latest Sun Cellular promos, feel free to visit again. You can also go to www.suncellular.com.ph or Sun Cellular Facebook page for further details on their latest offers.